One of the more interesting early ‘talkies’ I’ve seen. 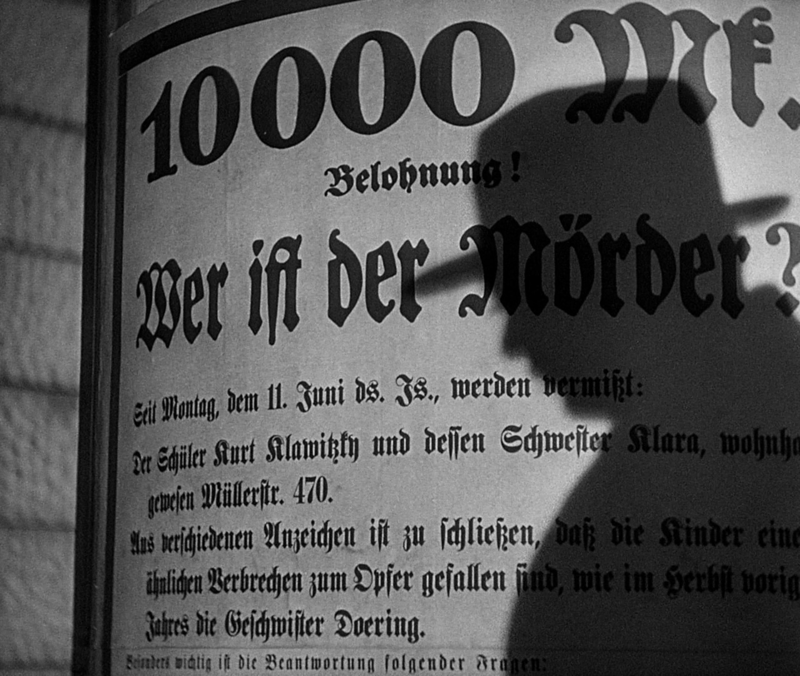 Fritz Lang dramatically enters the sound era with a film that captures fear, paranoia and the future all in this one powerful expressionist thriller. M launched the career of Peter Lorre, who stars as Hans Beckert, a child murderer who finds himself chased by all levels of society after his deeds cause Berlin to enter into a bizarre state of random accusation. The story interested me mostly because it showed various aspects of class desperate for justice, from the police to criminals. Although the narrative is a very simple one, it was one of the first films that involved the hunting of a serial killer in its plot. The audience are not even introduced properly to Beckert until roughly half way through the film, but it doesn’t matter because what I loved most even before Beckert is ever seen is the obsession to hunt him down! More importantly, it was an interesting film about surveillance and how different levels of class use newly developed techniques, such as the police using handwriting analysis and criminals hiring beggars to look out for Berlin’s children. Lorre portrays Beckert very well, presenting to the audience a mentally ill man who can’t help his bloodshed due to his fear of his shadow, his pathological monster! Beckert’s whistling of In the Hall of the Mountain King (performed by Lang due to Lorre not being able to whistle) made me, and I assume the audience enthralled with fear on what was going to happen next. As this was Lang’s first sound film, I noticed interesting forms of experimentation in contrast to other ‘talkies’ being released at the time, such as sounds occurring off camera and suspenseful moments throughout the film containing nothing but silence then adding a rush of sudden noise. Besides that, I loved the cinematography by Fritz Arno Wagner, it provides the audience with deep expression, especially with the use of glass and reflections which connote Beckert’s entrapment of self. The shots of him in daylight looking at his reflection specifically imply his perception not of a monster, but of a disturbed man. All in all, I highly recommend this as much as I recommend Lang’s Magnum Opus, the 1927 masterpiece Metropolis. A brilliant sound debut from Lang which maybe, just maybe foreshadows German society on the verge of Nazism.